Home > Breeding Animals > Working in an Abattoir? If the meat you buy is sliced and ready-portioned; wrapped in clean, sterile, plastic; bears no obvious resemblance to the animal it came from, then, like most of us, there’s probably not much chance that you think about the important transition from live animal to dead meat. Why would you? When you buy your meat from the butcher, you see more realistic signs that your Sunday joint was once a grazing creature. We don’t have to think about it too much though: because someone else does it all for us. The word abattoir comes from the French word ‘abattre’ meaning ‘to fell’. So, what is it like to work in an abattoir as a ‘feller’ of animals? You may have seen the programme when the home-reared pigs of a certain famous TV chef made their final journey to an abattoir. Those famous porcines were just one of the many animal species dispatched to abattoirs in the UK. There was a time when most areas had one or two small abattoirs, most of these have since closed and been replaced by larger businesses. No academic qualifications are needed but some experience of handling animals/butchery, or food safety procedures, is helpful. English and Maths at GCSE level are useful if would-be-employees wish to train further in this sector.Training is provided on the job, as is the necessary protective clothing.The starting salary for an Abattoir Operative is around £12,000 on average. Further training and experience may lead to the position of Supervisor, Manager, Trainer, Product Development and work related to Food Marketing. Salary increases apply to these positions. An abattoir operative’s first contact with the animals scheduled for slaughter is made when the livestock is unloaded from the trailer, or lorry, they’ve been transported on. This crucial stage should be handled with calm sensitivity and the animals kept under control.A Government approved veterinarian is on site to ensure that the animals don’t suffer and that the meat is suitable for human consumption.Animals are humanely slaughtered once they are unconscious. A captive bolt stunner (stun gun) or electrical equipment is used efficiently and painlessly to ‘knock out’ the animal. High standards of cleanliness are essential throughout-and between-each stage of processing. The importance of food hygiene is paramount at all times, as is safety with knives, handling, carrying and the lifting of carcasses.Operatives need to be physically fit and are expected to work quickly and efficiently.Some areas of an abattoir are cold to work in because of the need to keep the meat refrigerated. Strong chemicals may be used during the cleaning processes of equipment. The average working day starts at 6am and lasts for 8-9 hours. There are occasions when longer working days will be required. 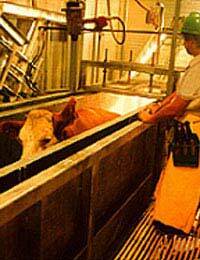 Managers oversee their staff and each stage of work in the abattoir. They strongly encourage greater efficiency: to improve yield and reduce waste during meat processing. This may be a career entered into by personal circumstances, rather than choice; but all the time consumers demand meat products there will be employment opportunities for those that can do it!